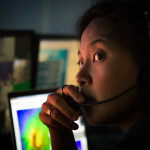 Scientists communicate with onboard personnel in real time. 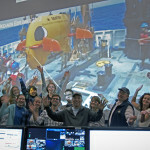 Scientists celebrate the end of another successful mission! Students interact with shipboard science team. Scientists monitor science activities during an expedition. 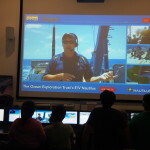 ISC Director Dwight Coleman gives a presentation to ISC from aboard E/V Nautilus. Scientist utilizes the Intercom system to connect with the onboard science team. Research and Exploration Vessel expeditions that operate underwater vehicles require additional technical and engineering staff to support operations–therefore, the number of berths available to scientists are scarce. 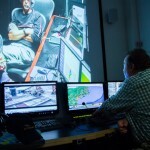 Telepresence is the alternative solution to these limitations. 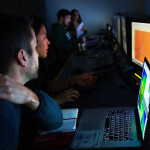 The Inner Space Center Mission Control can accommodate up to 8 scientists and/or students in Mission Control, where they can participate virtually in the cruise. From Mission Control, scientists can view all incoming video feeds, gain access to incoming data, communicate with the ships directly via intercom, participate in onboard discussions, and direct operations (12 hour/day maximum). Please contact for pricing. Weekly discounted rates available. Meals and/or housing support can be arranged for an additional fee. Additionally, the ISC can be utilized to facilitate live interactions with museums, school groups and classrooms to discuss relevant learning objectives, highlight new discoveries, and encourage students to engage in exploration missions. Please see our Education Services page for more information. To coordinate a live interaction for your class or participate in an upcoming mission please contact us. © 2019 Inner Space Center.  The Inner Space Center is located at the University of Rhode Island Graduate School of Oceanography. The ISC is funded by the following major partners: URI-GSO, National Oceanic and Atmospheric Administration and Ocean Exploration Trust.